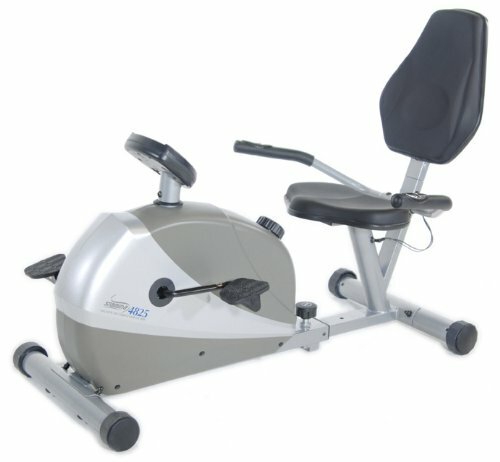 Magnetic resistance system offers a smooth, quiet workout Wheels for easy transport InTouch one-button control electronic monitor displays workout time, speed, distance, and calories Comfortable padded seat and oversized weighted pedals Dial tension control sets workout intensity with ease Levelling stabilizer caps provide a smooth and comfortable workout Sturdy steel frame Measures 56L x 26W x 33.5H inches Power requirement: 2 AA batteries included Manufacturer's warranty included: see complete details in the Product Guarantee area Founded in 1987, Stamina is dedicated to building a stronger, healthier you. The company supplies high-quality products at excellent value to the fitness and leisure markets, showcasing hundreds of products around the world over the past two decades. Stamina is responsible for such brands as Body by Jake, Suzanne Somers, Tony Little, and more. Their mission is straightforward and admirable: Stamina strives to outperform the competition by maintaining effective communication, consistent quality, and superior service. They will continue to pursue perfection through the design excellence of these home fitness products. Assembled dimensions: 56L x 26W x 33.5H inches. 6 preset programs for workout intensity. Comfortable padded seat and oversize weighted pedals. Fingertip pulse sensors built into handrails. InTouch monitor shows pulse, calories burned, and more. Wheels for easy transport. Manufacturer's warranty included (see product guarantee).